Trick or Treat can be a lot of fun! It’s the one time of year we overcome our fear of knocking on strangers’ doors. It’s a time when we can dress up and pretend to be someone we’re not. Masks can obstruct vision and make it difficult to see. Therefore, consider face paint or make up instead. Trick or treat is better in groups. Younger children can go with parents, family members, or baby-sitters. Older children can go in groups of friends and should let you know where they’re going. In conclusion, kids should not be out at night alone, on Halloween or any other night. All-black costumes are difficult for drivers to see in the dark. If your child must be Darth Vader (or another character who likes the all-black aesthetic), attach reflective tape to the costume to increase visibility. If you’re behind the wheel this Halloween, slow down and watch for the little ghosts and goblins. They might not always remember to look both ways, or they might be stumbling in bulky costumes. Halloween parties are a good alternative for anyone who doesn’t feel comfortable going door-to-door. You can have all the fun of dress-up, treats, and games in a familiar environment. Consider setting out a bowl of tiny toys, pencils, erasers, super balls, and other novelties for kids with severe food allergies. These items are inexpensive, fun, non-perishable from year to year, and don’t cause cavities. Inspect all candy before your kids eat it. Be wary of unwrapped candies, homemade goods and treats with damaged packaging. Slice up apples for your kids to eat rather than biting into them whole. 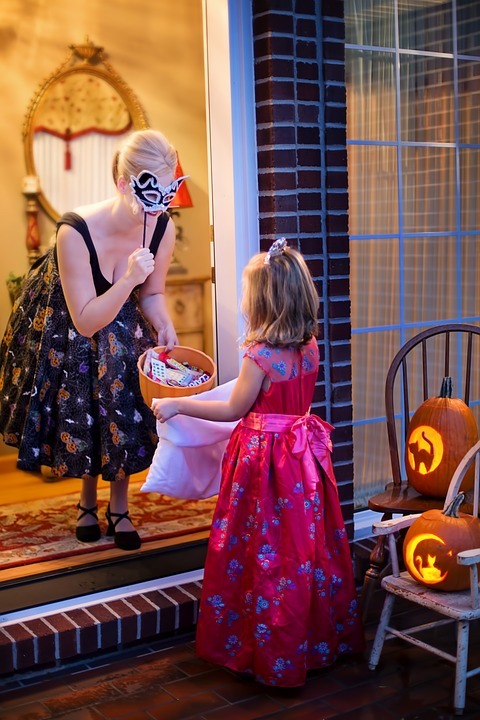 Put Halloween candy in a bowl and let your kids choose a treat after dinner each night. Instead of upset tummies from a candy binge, your kids will be able to enjoy their treats for weeks to come. Costumes don’t have to be expensive. Simple accessories can turn a child into a prince or princess, witch or wizard, werewolf or vampire, super hero or super villain. Face paint and glitter can turn kids into animals, monsters, pirates, and pixies. Trading costumes with family, friends and neighbours, or checking out a thrift store, are also good ways to save. And once Halloween is over, costumes can go into dress-up boxes for year-round play. The staff of Sheppard Chiropractic and Laser Healing wish you and your little beasts and ghouls a very happy Halloween!